Review: Who could be writing these things on the wall about me? What is going on with Circe, and how will I deal with my father? are questions I would be asking if I were Samantha in the book. "Dead is Just a Rumor " a book of suspense, thrill, and humor, written by Marlene Perez. This is the third book in the Dead Is series. The main characters throughout the series are Daisy and Samantha. The name of the series is "Dead is". The characters are in high school and around the age 16. The plot of this is book very interesting. Daisy needs to find out exactly who or what is writing things on the girls and boys bathroom walls about her. But, in the mean time, Daisy wins cooking lessons with the "world famous" chef, Circe Silver tongue! Wait that is a good thing, right? Isn't that what all of the cooking lovers would want? Well that's what Daisy first thought, but boy was she wrong. Daisy is in for a rude awakening with Circe Silver tongue! I liked that the author wrote the book so that people in middle school as well as high school could relate to the book. I also liked was how the author made the main character (Daisy) not afraid to say or do anything. But, it did feel like the author was sort of rushing the story. She could have slowed down a little. Plus, the story was all over the place. For example, I would read a problem with the chef (Circe), and then there would be a problem with the writing on the bathroom wall. So basically, the author kept on switching from this problem to that problem in each sentence. This does get confusing. I think some people might stop reading this book because it does take a while in for it to get good. But, I would give this book a try, and if you like it, there are other books in the series. 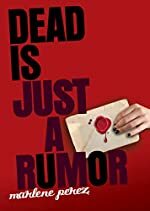 We would like to thank Houghton Mifflin Harcourt for providing a copy of Dead is Just a Rumor for this review. Have you read Dead is Just a Rumor? How would you rate it?